Intelligence sharing has always been a highly sensitive area of transatlantic relations. The recent revelation of the National Security Agency’s (NSA) surveillance program PRISM in June 2013, namely the case of Edward Snowden, has brought to light unsolicited inter-governmental collection of information. These revelations concerned publics on both sides of the Atlantic as even the closest of alliances were not free from accusations of spying. This has led to a renewed debate over the legality of government surveillance on both sides of the Atlantic and has aroused anger and curiosity in Germany as well as in the US. Besides, these current issues are likely to affect the negotiations to the Transatlantic Trade and Investment (TTIP) partnership or even the upcoming federal elections in Germany. Angela Freimuth, Deputy Chairwoman of the FDP Parliamentary Group in the State Legislature of North Rhine-Westphalia and Spokesperson for Innovation, Science and Research for the FDP Parliamentary Group in the State Legislature of North Rhine-Westphalia, thoughtfully began a lively and topical discussion on the question of data collection. She provided an honest reflection about data collection, admitting that all governments track data on some level. 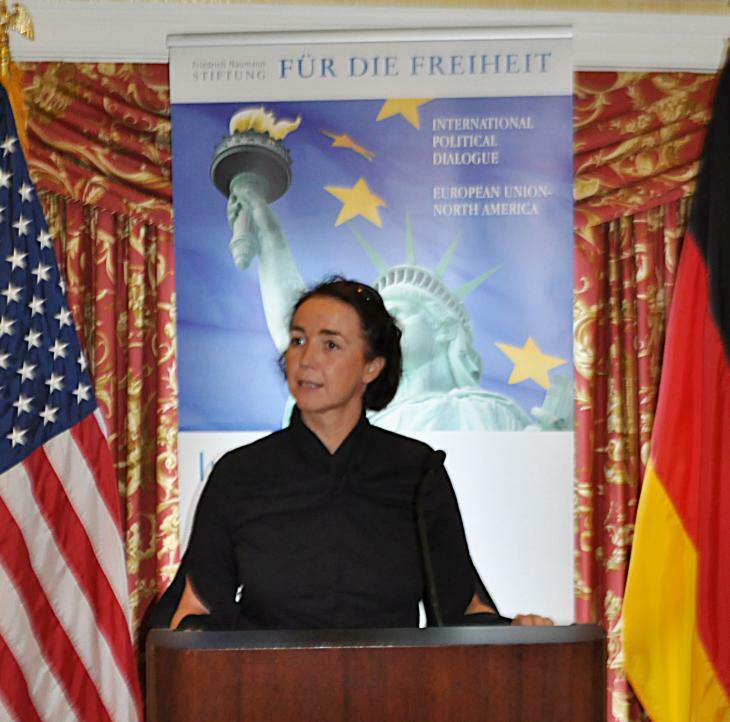 Mindful of her audience, Freimuth gave an overview of the deepness of the U.S.-German friendship. The friendship “is second only to European integration” in German eyes, she explained, and is founded on common values. The closeness of the two nations made Snowden’s revelations all the more emotional as Germans often look towards the U.S. as moral ally. Angela Freimuth personally is deeply concerned about any form of data collection – private or public. Believing in what she calls “information self-determination” she feels that any form of amassing data provides an opportunity for a leak. While she understands that data collection can be useful for circumventing potential risks, she asserted that traditional investigations provide a more legal means to what often are similar ends. Angela Freimuth emphasizes the need for both domestic and cross-Atlantic debate about informational self- determination of human dignity, freedom and democracy. The Deputy Chairwoman of the FDP Parliamentary Group in the State Legislature of North Rhine-Westphalia also showed a possible impact on recent polls in Germany’s upcoming elections for the Bundestag in September, not significant but still considerable. Freimuth further underlined that especially for Chancellor Angela Merkel, this has been the first incident which could bring her into trouble and burden her credibility. But there is high uncertainty or even doubt about whether these events could really influence the federal election results in the end, Freimuth explained.